Mid-County Coop of Waverly – New name you can trust with the same great service! New name you can trust with the same great service! 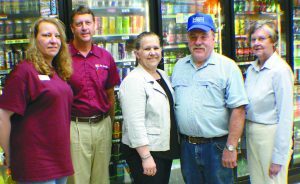 Pictured are: store manager Missie Beckmann, Mid-County Coop General Manager Bill Reimers, Giny Karels, Mark Karels, and Waverly Mayor Connie Holmes. After 43 years and seven months, Mark Karels is retiring as the owner of Mark’s Service in Waverly. He sold the business – including a car wash, gas station, and convenience store – to Mid-County Coop effective June 21. 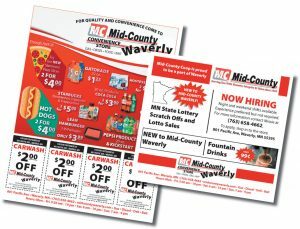 Mid-County has been serving the Waverly area for many years, and General Manager Bill Reimers said he is looking forward to the coop’s continued community involvement. Although much of the business is staying the same, customers may notice a few small changes. The new name, for instance, will be Mid-County of Waverly. Also, since the Tesoro brand is being phased out nationwide, the gas station will be rebranded sometime this fall. CLICK HERE to visit Mid-County Coop’s main website to learn more about all the great services Mid-County has to offer!